When do I need to hire a CPA, like yourself? You receive a letter from the IRS or state department of taxation. You hate record keeping and want someone else to do it. You know there are more tax deductions that you could be taking. You hate tax preparation and want someone else to do it. When you need help setting up a record keeping system. When you need to be trained in QuickBooks. You need advice on the pros and cons of Limited Liability Company (LLC) status. You have heard that you can reduce your income tax by forming a corporation. A friend is audited for something that you have been doing for years. 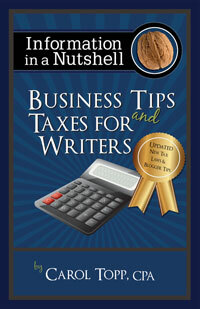 Learn how to run your writing business better. Updated for the new tax law changes from 2018!